independent transport videos were proud to be asked by the organising team to produce this official DVD of this new event that took place in King’s Park, Bournemouth on Saturday 10th June 2017. As a supporter of the event, our cameras were on site very early in the morning to record the arrival of the buses and coaches as they took up their positions on the rally field. The event was keenly supported by the two main local bus operators, RATP Dev – Yellow Buses and Go-Ahead South Coast. One of the main reasons for the event was to celebrate 115 years of public transport in Bournemouth, which Yellow Buses are promoting during the year. Yellow Buses sent four of their current fleet including 30 (YX65 RGZ) an ADL200 single-decker, known as the “The History Bus” as most of it’s interior panels display photographs of buses, trams and trolleybuses over the past 115 years. During this programme our cameras take a look inside. Also present was 432 (HJ02 HFC), a Volvo B7TL convertible open-topper, now converted for open-top service during the summer, as this is the first summer season featuring open-top buses in service by Yellow Buses after a gap of 10 years. Additionally, 190 (BL14 LTJ), a Volvo B9TL with a Wright body and 200 (SN17 MTO) an ADL 400MMC one of the latest batch of six new double-deckers to enter the fleet worth £1.3m which is featuring all the latest technology. 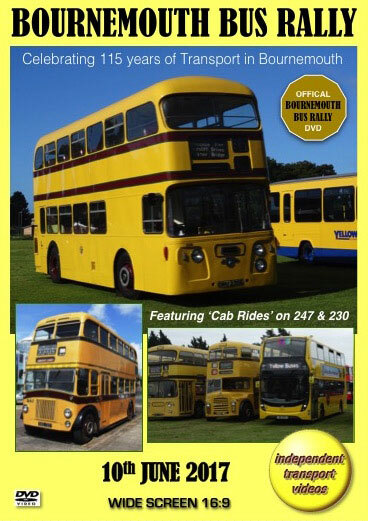 But the stars of the show were the many preserved Bournemouth Corporation/Yellow Buses vehicles that attended. There were ten single and double-deckers, including Leyland Tiger PS2 - 46 (JLJ 403), Leyland Tiger Cub PSUC1 - 266 (RRU 903), Leyland Titan PD2 - 247 (KEL 133), Leyland Titan PD3 - 159 (8159 EL), Leyland Titan PD3A -167 (6167 RU), Leyland Atlantean PDR1/1 - 170 (AEL 170B), Leyland Leopard PSU3 - 103 (CRU 103C), Leyland Atlantean PDR1/1 - 230 (ORU 230G), Dennis Dominator 262 (H262 MFX) and 455 (M455 LLJ) a Dennis Dart. All of these buses were immaculately turned out in their original liveries and looked a real treat displayed on the rally site. You will see all of the other entries, too many to mention here, on this video programme. We also take two ‘Cab Rides’ out along the streets of Bournemouth and surrounding suburbs covering the routes that had been operated by Bournemouth’s buses over the years. Our first is for 35 minutes onboard 247 (KEL 133), a 1950 Leyland Titan PD2/3 with a Weymann FH58D body. We get the drivers eye view as our camera is mounted in the full fronted cab taking in the sights and sounds for you to enjoy. Our second ‘Cab Ride’ lasts 20 minutes onboard 230 (ORU 230G), the 1969 Leyland Atlantean PDR1/1 with an Alexander body. On this we travel past the former Bournemouth Corporation/Yellow Buses depot at Mallard Road, now a listed building but housing a Homebase superstore. After returning to King’s Park for more filming, our cameras take up their position on Bath Road and Westover Road in Bournemouth to see a superb convoy of preserved Bournemouth buses as they parade through the town. We hope you enjoy this DVD video as much as we did producing it for you. Here’s to 2018!